When developing the new HairMax for den•si•ty Collection, the company set out to devise a structure that worked to cleanse, nourish and treat the scalp – providing a healthy base to stimulate new, healthy hair growth. While they can be used on their own, the scientifically formulated healthy hair care products also work synergistically with the LaserComb to enhance, invigorate, revitalize and fortify weakening hair follicles. This scalp treatment deeply cleanses and exfoliates the scalp dissolving excess sebum, perspiration and environmental pollutants that can clog hair follicles and inhibit hair growth. An invigorating blend of menthol and peppermint oil leaves your scalp feeling refreshed and revitalized. Sold separately and as a collection for $89. 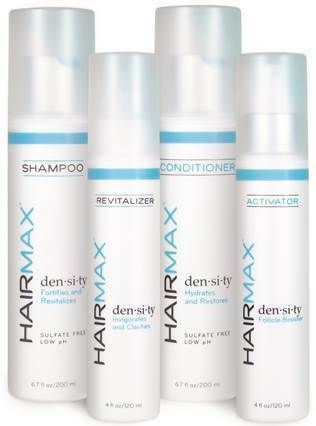 The HairMax for den•si•ty Collection will be available at ULTA stores nationwide Spring 2014.